A recent article demonstrates the unique suitability of the DriverMap Expression Profiling Assay for blood biomarker analysis. In Scientific Reports, Tarca, et al. reported that DriverMap Targeted RNA sequencing identified more potential biomarkers associated with spontaneous labor than either standard Illumina RNA-seq or Affymetrix Transcriptome Arrays. Blood carries markers for changes related to disease progression, tumorigenesis, drug treatments, diet, or other physiological responses. The trick is to detect the specific changes of interest. Broad screening methods for proteins and other biological intermediates are limited, but RNA can be assayed rapidly and robustly in a standardized highly parallel manner to identify suitable clinical biomarkers. 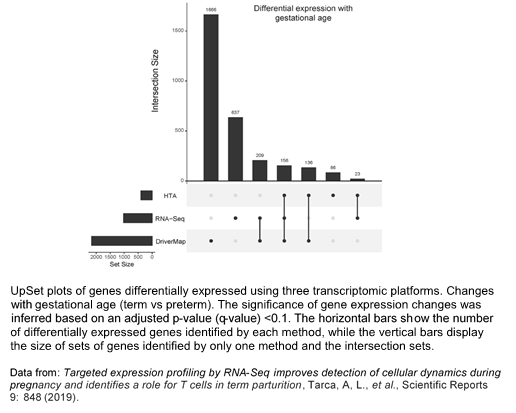 DriverMap Genome-Wide Expression Profiling System provides a convenient targeted RNA sequencing approach that is particularly suited for this purpose. DriverMap Targeted RNA sequencing specifically amplifies a short representative sequence for each gene transcript. As a result, sequencing is significantly simplified and the resulting data from NGS can be directly correlated with expression. Further, the large number of rearranged beta-globin sequences in blood samples produce high levels of background and complicate bioinformatic analysis. Typically, beta-globin depletion of blood samples is required which, in addition to being inconvenient, can compromise the quantitative reliability of the analysis. With the DriverMap Assay, however, targeted primers for each gene eschew interference from background ribosomal or beta-globin RNA. Total RNA samples can be used directly so sample preparation is simpler and the resulting data cleaner. Based on the transcriptome profiling data, the researchers were able to identify a set of T-cell-specific marker genes show, for the first time, a significant increase in these with the onset of labor (as shown in figure). This finding is consistent with other studies suggesting a general role for T cells in the labor process.